I am grateful to a commentator for drawing this legal case to my attention. I do not claim have read all the decision. If you refer to it you will note that it is of considerable length. However, the essence is simple. 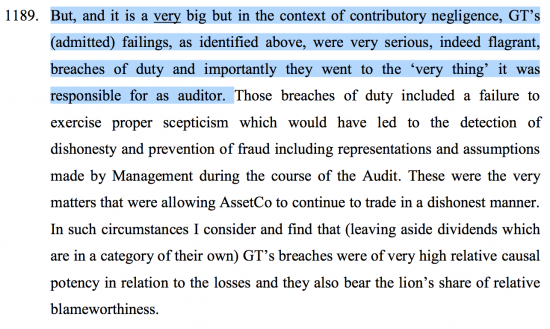 It was claimed that a company failed due to management negligence and that the failure should have been identified by the auditors, who were Grant Thornton. 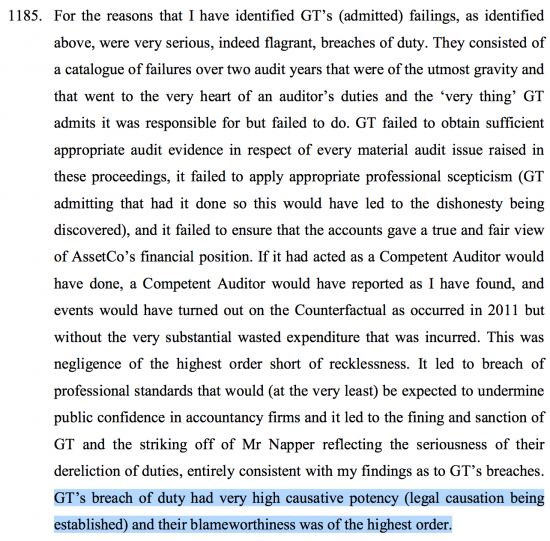 What is then argued is that if the auditors had done their job properly many losses would have been prevented. In both cases I added the emphasis. The point is unambiguous. Grant Thornton did not just fail. They were grossly negligent. And so liable. Because, and let's not beat about the bush, they appeared not to know what an audit was for. Or, if they did, then they failed to do one. But only this week they claimed it was not their job to found fraud in representations to parliament. As is very obvious, that's not true. Auditors do have such a duty. Now let me suggest what this implies. Firstly, anyone who thinks that the problems of auditing can be solved by bringing in the mid-tier firms is very obviously wrong. This blows the CMA suggestion of joint audits apart: Grant Thornton are clearly not up to the task of participating in that process. Second, this, then, makes clear that there is no private-sector solution to auditing in this country. The auditing profession has so lost its moral and professional compass that it appears no longer able to express sound opinion. And third, therefore, state intervention is now inevitable if auditing, which is a fundamental component of successful market capitalism within a mixed economy, is to survive. It’s time this was recognised. Then we could get on to the other essential task of making sure that the accounts that are audited are meaningful, which is an even bigger issue that has to be faced. As an accountant, not an auditor, at GT, this is still going on and is worse in local government than private companies, according to meetings I sit in on regularly. If the audit is no use to even those companies that are paying for. it is actually no use any longer to anyone. Trading standards presumably don’t engage in battles at this level, but this is a failure to provide a service fit for (any) purpose. Unfortunately we don’t have government at present, only a Brexit squabbling committee, so I don’t suppose anyone is taking any notice. This business operates in Jersey. So what status does this decision have upon its operations here. 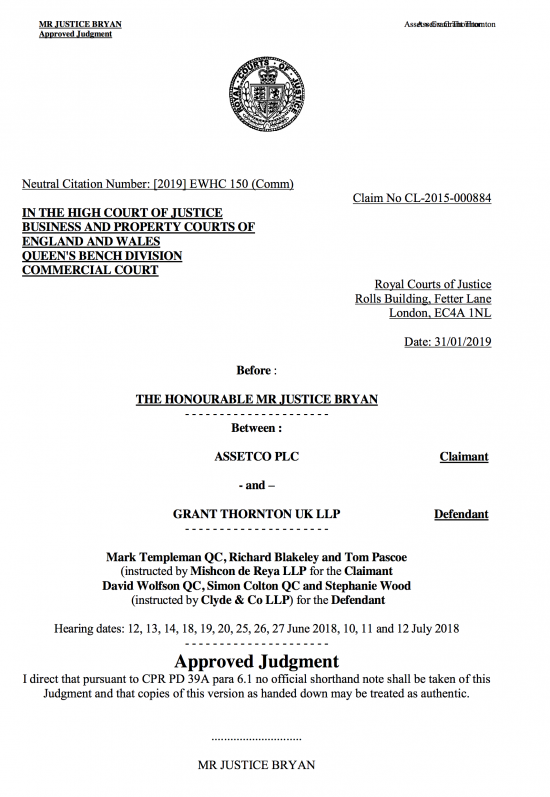 Shall they be disciplined in the UK by any body and if so should the Jersey Financial Services Commission respond in any way or is the Jersey business deemed as a different entity. 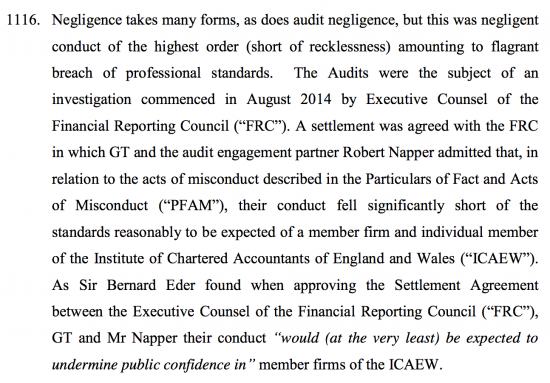 However when the FRC comment in their report “These sanctions will also serve to protect the public and deter future Misconduct in the audit profession” it looks as if they are unduly optimistic. Quis custodiat ipsos custodes comes to mind. Should the FRC consider proactive ‘audits’ or reviews of the quality of auditors work rather than just a reactive enquiry when damage has been done. It is not by accident that we have ‘dumbed-down’ education (to the extent that we have a ‘b’ in ‘dumb-down’ …….to disguise its origins…?…). Education ministers who really do believe the third of the ‘r’s stands for ‘rithmetic’. I noticed the other day that our prison population gets fed on puddings. No main course; they get just desserts. No wonder the trolls don’t like it here. With an average reading age of 12 in the population at large, we have twelve as an average thinking age. Hence Brexit I suppose…which even the Prime minister cannot come up with a synonym, or explanation for and has to resort to Humpty Dumpty’s assertion that a word “means just what I choose it to mean—neither more nor less”. Has anyone ever calculated an average thinking age? Indeed, but the inability to read constrains the think in rational terms. Andy – I love this blog too – sometimes I find your comments a bit difficult but this one is thoroughly entertaining – “great stuff guys” (as readers of PEye will recognise)! However we must find the right incentives. The auditors and FD and CEO have little to fear because the Shareholders are the ones that get fined, they appointed and approve themselves and they use the shareholders money as they wish. Attendees invited by the committee to attend but not vote, such as the Trade Union leader for the entire entitiy, would also have a very good insight into where in the books to look from their members suggestions. The shareholders attending representing all shareholders would greatly value the insight as both shareholders and union members want the company to continue paying wages and growing without fraud or embezzlement. Any progress in higher circles on SNAC committee implementation?